Ready to reclaim a damaged lawn? Whether you’ve neglected routine care or have weeds taking over despite your best efforts, a lawn renovation can be just what you need to restore the look you once loved. At O’Grady’s Landscape, we have the experience you need to see the results you want. Our landscapers thoughtfully plan out each detail and just as carefully complete the renovation process to ensure the job gets done right. Revive your lawn and bring beauty back to your turf! Call O’Grady’s Landscape today at 703-533-5001 to schedule a lawn renovation in Great Falls, the City of Falls Church, North Arlington, Vienna, or McLean. Is It Time for a Lawn Renovation? If you’re still unsure whether or not you need a lawn renovation, our landscapers can assess the condition of your turf and offer a recommendation—either for a full renovation or for one of our lawn care services that’s suited to your particular need. Watering – the finishing touch to promote growth! Keep in mind that fall and spring tend to be the best times for lawn renovations in Northern Virginia. Transform your turf with a lawn renovation by O’Grady’s Landscape! When you call us for your project, we’ll ensure your grass gets all the nutrients it needs to grow and gain strength, providing you with seeds of the highest quality and taking special care through each step of the process. 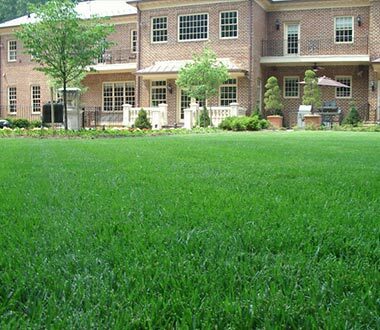 With years of experience helping homeowners in Great Falls, the City of Falls Church, Vienna, McLean, and North Arlington with all their lawn care needs, you can trust us to get you the beautiful, disease-free yard you’ve always wanted. It’s time to finally give your landscape that much-needed makeover. Call us today at 703-533-5001 for an estimate on your lawn renovation project in Northern Virginia!